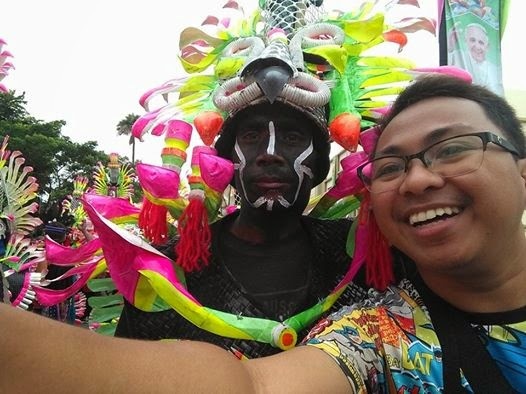 A selfie with an "Ati" in colorful neon costume! Creatively done costumes. I was impressed! I, myself, had witnessed a powerful scene back in 2010, when our community in Malabon was razed by fire – an old woman tightly embracing her Sto. Nino statue, the only “property” she was able to save. This was the subject of the poem that I wrote and was published in CCP Ani Journal, three years ago. Thus, while dancing with the crowd, I took photos of various images of the Holy Child, during the “sadsad”. Filipinos just love dressing up their Ninos! The costumes usually reflect the owners' trades or hobbies; sometimes, they just wanted to adorn their Sto. Ninos, just because. Here are some of them. Sto. Nino in white dress and red cape. The chipped off face brought the drama. Sto. Nino in red, little boy shirt and shorts. I love the smile of the owner, it's as if its his kid! Sto. Nino in Mickey Mouse shirt. The Holy Child was this old man's grandson. Sto. Nino wearing the same costume as the one holding him! ...and it didn't matter who holds him. One of the best, indeed! An old man in a Sto. Nino costume! Festivals like Ati-Atihan will always be here. I just hope that we do not forget the essence of these celebrations. I will be traveling the Philippines to witness these events. Gala pa more!